Evaporative cooling is one of the worlds oldest forms of cooling. In fact, it dates back to when the Egyptian pharaohs used a form of evaporative cool­ing in their temples and palaces. 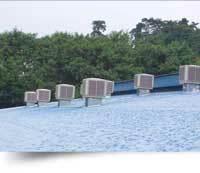 Nowadays, evaporative cooling still works on the same principle of fresh air being cooled as it passes over water. Which means that no harmful chemicals or ozone damaging CFCs are be­ing used in the cooling process. Equally important, this cool and continual change of fresh air every two minutes does not allow any build up of stale, recycled air as is often the case with refrigerated air conditioners. Evaporative air conditioners is also very affordable and efficient in keeping work and living spaces cool. 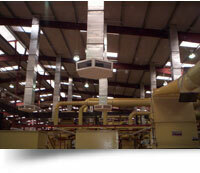 The high air movement is suitable for factories with the benefit of low energy consumption. The once-through air is a major advantage to prevent cross contamination and has been used successfully even for the operating theatres. Kitchens need exhaust air for the exhaust canopies and supplying the restaurant area, whilst designing the exhaust air to escape through the kitchen canopies a two-in-one solution. This would also be applicable to restaurants. The short duration of the midday meal tends to offset the high wet bulb days. Since clients are entering from a warm environment and shopping for only an hour or less, the warm summer maximum temperatures have a negative impact on their shopping patterns. A good solution is the over pressurisation produced by the evaporative cooling system. Extremely successful especially when the main occupation occurs at night. 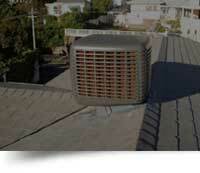 Low running costs and full fresh air intake make evaporative cooling an attractive proposition.